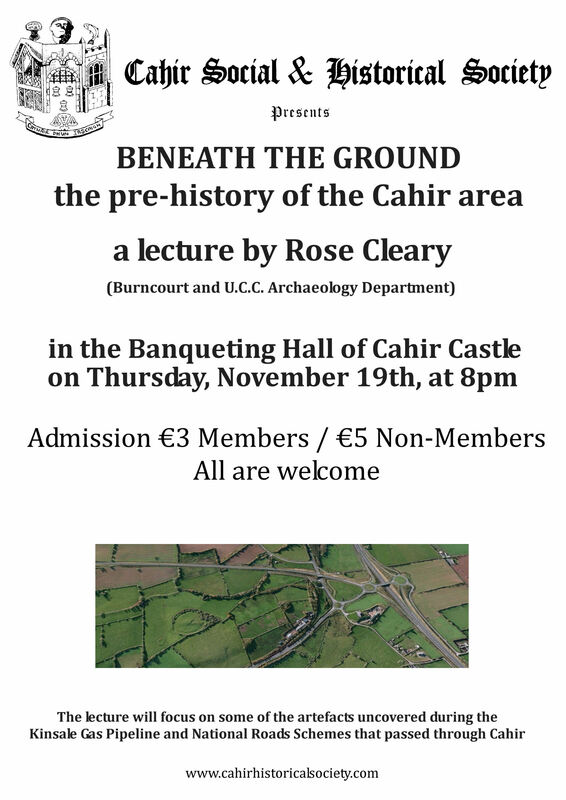 Cahir Social and Historical Society will host a lecture by Rose Cleary(Burncourt and U.C.C. Archaeology Department) at 8pm on Thursday, November 19th, in the Banqueting Hall of Cahir Castle. The title of this lecture will be "Beneath the Ground - the pre-history of the Cahir area" and it will focus on some of the artefacts uncovered during the Kinsale Gas Pipeline and National Roads Schemes that passed through Cahir. Admission will be €5 for Non-Members and €3 for Members. Members are also reminded that 2015/16 Subscriptions are now due.